The Western Valley Regional Service Commission, a body corporate, was established in January 1, 2013. WVRSC is a consolidation of the former Rural District Planning Commission and the Valley Solid Waste Commission. The Regional Service Delivery model stems from the Government of New Brunswick Action Plan for a New Local Governance System in New Brunswick (2011). The Plan outlines the formation of 12 Regional Service Commission for the main purpose of planning, facilitating, and delivering services to both municipal and unincorporated communities (Local Service Districts (LSDs)). The Western Valley Region includes the area delineated in the embedded map. 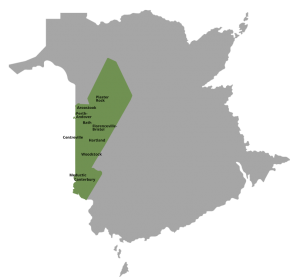 This is the area serviced by The Western Valley Regional Service Commission (WVRSC).